Gold hit a three-week low on Tuesday, and silver its lowest in four weeks as the dollar strengthened and expectations increased that the U.S. Federal Reserve will soon reduce monetary stimulus. Gold is down more than 23% this year, dropping to a near-three year low of $1,220 at the end of June, and is set break its unbroken 12-year bull run this year. Some investors lost faith in the metal amid a U.S. equity rally and low inflation. "Tapering has become the centrepiece again," Frank McGhee, the head dealer at Integrated Brokerage Services in Chicago told Bloomberg News. "There is no reason for gold to go higher in the current environment." Spot gold hit its lowest since Oct. 17 at $1,275.80 an ounce in earlier trade. 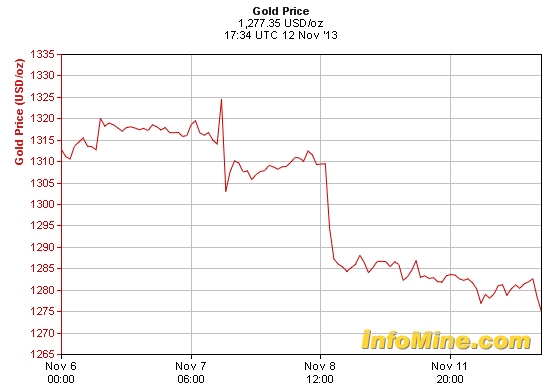 It was down 0.2% at $1,280.16 by 14:46 GMT. Prices swung between gains and losses, earlier rising as much as 0.3%.